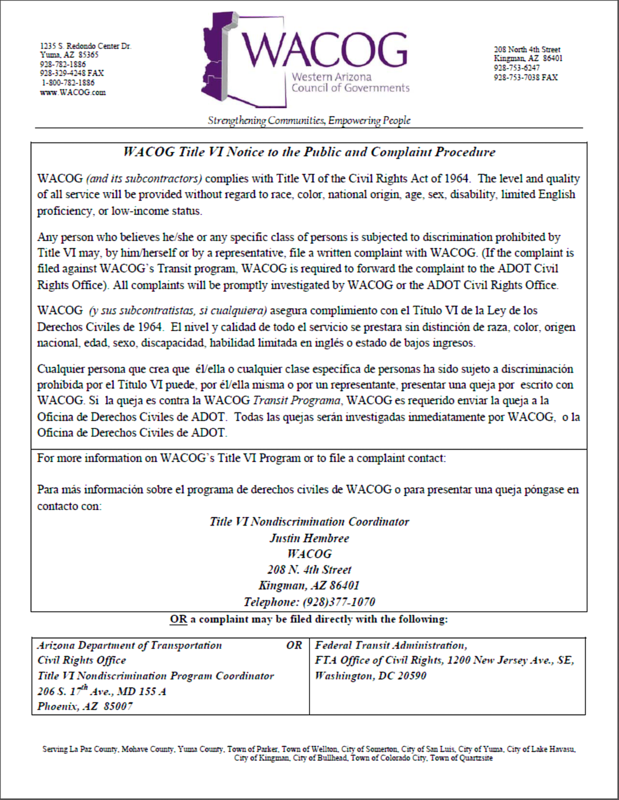 Western Arizona Council of Governments (WACOG), as a condition to receiving Federal financing assistance from the Arizona Department of Transportation (ADOT), agrees to comply with the Title VI of the Civil Rights Act of 1964 and the 1994 Presidential directive of 1994, Executive Order 12898. WACOG will make every effort to hold public meetings in facilities that are Americans with Disabilities Act (ADA) compliant; and, arrange for reasonable accessibility and accommodation to persons with disabilities. Further, to provide equally effective communication, WACOG will make due preparation, when appropriate, for persons requiring assistance, such as the hearing or visually impaired, upon request.